The 1st Battalion arrived in Shackleton Barracks, Ballykelly, in February 1988 after 2 glorious years in the divided allied city of Berlin. 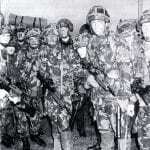 A few days after their arrival, the Battalion was deployed with A Company to Auchnacloy on the border, B and Support Companies to Belfast to cover the funerals of the IRA terrorists killed by the SAS in Gibraltar and C Company as Brigade Reserve remaining in Ballykelly covering Londonderry. The Battalion arrived with the new infantry rifle, the SA80, which was the first time it had been seen in this part of Northern Ireland. Companies rotated through Dungannon and Cookstown with platoons at police stations in Pomeroy and Coalisland. These bases were regularly attacked with mortar and small arms fire but thankfully there were no serious injuries. In addition, the battalion occasionally deployed by helicopter with a small tactical headquarters and 2 companies with the aim of disrupting terrorist planning and operations. 1988 – 90 was one of the most difficult times in Northern Ireland with many terrorist incidents most of which involved the loss of life, occurring throughout the province and especially in the Battalion’s Area of Operations in East Tyrone. Companies rotated through Dungannon and Cookstown with platoons at police stations in Pomeroy and Coalisland. These bases were regularly attacked with mortar and small arms fire but thankfully there were no serious injuries. In addition, the battalion occasionally deployed by helicopter with a small tactical headquarters and 2 companies with the aim of disrupting terrorist planning and operations. There were many actions that demonstrated bravery and outstanding courage by Glosters. Once incident was when a part time soldier was shot dead at his place of work in a meat factory. Roads surrounding the incident were quickly blocked. One of the terrorist vehicles crashed trying to avoid the block and the occupants quickly seized. Another car was abandoned and the occupants ran across fields trying to escape but were chased, stopped and arrested by a Gloster patrol. By the end of the tour the level of violence had considerable reduced which is a testament to the long hours, tireless work and inquisitive nature of Gloster officers and soldiers. The Battalion received 32 operational awards for this period of duty, which remains a record to this day.